No. 1 Alabama is going to handle No. 16 Mississippi State with ease on Saturday in Tuscaloosa (3:30 p.m. ET, CBS). Agree? Good. Let’s move on. Saturday’s game isn’t one to ignore just because of the outcome. There is an opportunity for this game to go down in history. It could be the first game to feature two defensive lines with multiple first-round NFL Draft picks in the following year’s draft. 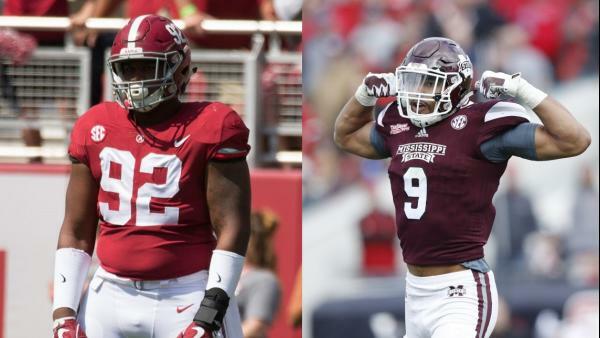 Those two pairs would be Mississippi State’s Jeffery Simmons and Montez Sweat, and Alabama’s Raekwon Davis and Quinnen Williams. All are draft-eligible in 2019 (Sweat is the only senior), and all are expected to be very rich six months from now. Ironically, coming into the season, Davis may have been the likely to be the first one off the board of the quartet, but his 2018 season to date has been somewhat underwhelming. He still is very much in the mix to be a first-round pick at 6’7” and 305 pounds, but the latest Pro Football Focus mock draft has Davis slipping out of the first round, with Simmons, Sweat, and Williams all being first-day selections. Those three have posted big numbers through the first two-thirds of the season. Sweat ranks third nationally with 9.5 sacks, and Williams and Sweat are tied for third in the SEC with 12 tackles for loss each. Simmons isn’t far behind with 9.5. Davis has been overshadowed a bit by the emergence of his teammate, but is still a key cog for a Crimson Tide run defense that has allowed an FBS-low three rushing touchdowns. My first question when looking at this matchup was, is there a precedent for a game between two teams with multiple first-round draft picks on the defensive line? There is, but I could not find an occurrence where all four players were drafted the year after the game was played. In 2001, Miami (FL) opened a national championship season with a 33-7 whitewashing of Penn State in State College. Neither had a defensive lineman selected in the 2002 NFL Draft, but both teams had a pair who played in that game go in the first round of the 2003 draft. The Nittany Lions’ duo – tackle Jimmy Kennedy (Rams) and end Michael Haynes (Bears) went first at picks 12 and 14, followed by Hurricanes end Jerome McDougle (Eagles) and tackle William Joseph (Giants) at 15 and 25. Go back a year prior to that 2001 game, and you’ll find an SEC game between Tennessee and Georgia in October of 2000. The Bulldogs were led by a dominant pair of tackles in Richard Seymour and Marcus Stroud. Both were top-15 NFL Draft picks in 2001. A pair of Volunteers tackles, Albert Haynesworth and John Henderson, would match that feat a year later in the 2002 draft. All four were on the field in Sanford Stadium that night 18 years ago. The only other occurrence I could find was also an SEC game, and it is one of the most memorable games in conference history. The 1992 SEC Championship Game will go down in history for its stakes, its drama, and its impact on major college football. Undefeated Alabama fought off a pesky Florida team that day in Birmingham, 28-21. The Crimson Tide’s dominant defense was led by defensive ends Eric Curry and John Copeland, who would be selected with consecutive picks in the first round of the 1993 NFL Draft. A pair of sophomores who would lead the Gators to SEC titles in 1993 and 1994 were on the opposite side of Curry and Copeland that day. Kevin Carter and Ellis Johnson didn’t get the hype that the Florida offensive players did during the early Steve Spurrier years, but they had the most NFL pedigree. After closing their Gators careers after the 1994 season, Carter and Johnson were picked No. 6 and No. 15 in the 1995 NFL Draft. Ironically, that list of 12 defensive lineman contains a lot of busts. Sure, Carter, Seymour, and Haynesworth were great players, but the majority of this group turned out to be disappointments. That says nothing about what to expect from the four who will be in Bryant-Denny Stadium on Saturday afternoon, but it is worth noting. Will this game become a first in the long history of college football? We won’t know for six more months. What we do know is that there will be a special collection of defensive line talent battling it out on Saturday afternoon in Tuscaloosa.